Senstad works in the multi-disciplinary intersections of installation art, photography, video, neon sculpture, light environments, and land art with a focus on the phenomena of perception, space and the sensorial realms of light, color and sound. She often creates works that are socially engaged as well as philosophical and poetic text based works in the public realm. 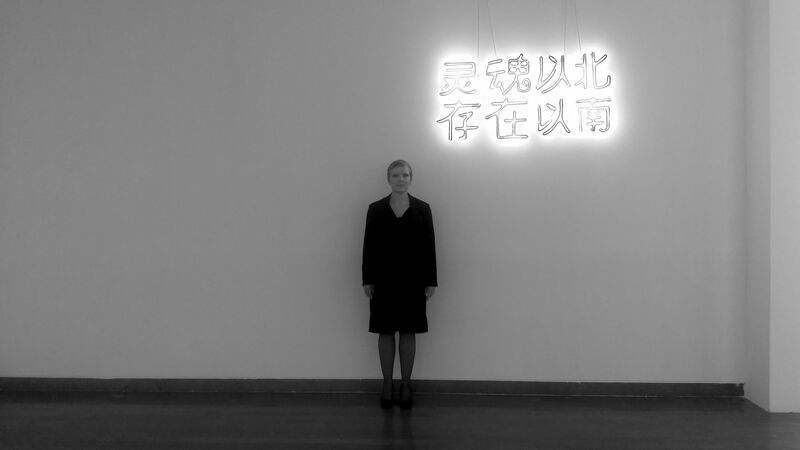 Senstad has exhibited internationally at galleries, museums and institutions including the 55th and 56th Venice Biennale (IT), Bruges Art and Architecture Triennale (BE), Kunsthall 3,14 (NO), Trafo Kunsthall (NO), Octavia Art Gallery (USA), Zendai Moma (CN), He Xiangning Art Museum (CN). She has participated in numerous video and light art festivals including Rencontres Internationales (FR), ISEA Dubai (UAE), Dallas Aurora (USA). She is the recipient of artist residencies at Marble House, Vermont(USA) and Abu Dhabi Arthub (UAE), and numerous artist grants from Arts Council Norway, OCA (NO), FFF (NO), NBK (NO),FCA (USA). Public Art Commissions include Snøhetta Architects; Wolfe Center for the Arts and Penn University Engineering Building with TWBT Architects (USA). Anne Katrine Senstad was raised in Singapore and Norway, today she lives and works between New York and Oslo, Norway. She received her art education at Parsons School of Design and The New School for Social Research in New York 1994 and 1999, and Berkeley University, CA in 1989. St Brigid's Centre for the Arts, Ottawa, Canada. Site Specific installation Kinesthesia for Saint Brigid, curated by Celina Jeffery Ph.D.
Stiftelsen 3,14 Kunsthall, Bergen, Norway. Is Her Name Red?, curated by Malin Barth. Yi Gallery x Usagi, Brooklyn, New York, USA. Leo Villareal, Timo Nasseri, Carlos Cruz-Diez, Nasser Al-Salem. Curated by Afia Bin-Taleb and Mohammed Hafiz. Galleri FineArt, Oslo, Norway. Syndere I Sommersol. A:Code.org.uk: Nordic DeLight, Light Art festival, London, UK. Curated by Vassiliki Tzanakou. Showing Color Synesthesia VI, 2015. Sound by Catherine Christer Hennix. Sideshow Gallery, New York,USA. The Greatest Show on Earth, organized by Richard Timperio, founder/director Sideshow Gallery. Øya Festivalen – Kunst på Øya, Aug 8-12, Oslo, Norway. GOLD GUIDES ME – Capitalism in the Public Realm, curated by Alexander Rishaug and Kyrre Karlsen. Knockdown Center, New York, USA. Nasty Women, exhibition and fundraising for Planned Parenthood, curated by Jessamyn Fiore and Roxanne Jackson. Carriage Trade, New York, USA. Socal Photography IV, organized by Peter Scott. Shoot Gallery, Oslo, Norway. OSLO+PARIS, Anne Senstad, Per Maning, Tom Sandberg, Eric Antoine. Curated by Helene Gulaker-Hansen. Bærum Kunsthall, Norway, Everything Else is Too Narrow. Anne Senstad, Christine Istad, Anna-Marit Staurseth, curated by Sarah Walko. Sonic Architecture/Sonica Festival, Museum of Transitory Art, Ljubljana, Slovenia. One Art Space, New York, USA.The Best Thought I Had, curated by Georgia Harrell and Suzanne Levesque. Views, Manama,Kingdom of Bahrain, Organized by Sharabi & Stafford. Video installation. Under the patronage of Shaikh Rashid bin Khalifa al Khalifa. CULTURUNNERS – project/residency, Textile Topography, a site specific textile intervention and cross cultural women artist collaboration by Anne Senstad taking place in Abha, Saudi Arabia. Supported by Office for Contemporary Art Norway, Edge of Arabia and Art Jameel Foundation. Dallas Aurora Festival – The Synesthesia Edition. Immersive site-specific projection installation at St Paul's Methodist Church, Dallas. Sonoptic Parallels – The Infinitesimal, 2014. Curated by Julia Kaganskiy, New Museum, NY. CULTURUNNERS, New York & Detroit, MI, USA. The Calligraphy Challenge. A performative project. Supported by OCA and Art Jameel Foundation. Joshua Treenial, California, USA. Site Responsive installation and performance Laboratory in the High Desert, curated by Dr KJ Baysa and Bernard Leibov. Organized by Honolulu Biennial and Boxoprojects. Bruges Art and Architecture Triennial, Belgium, GOLD GUIDES ME - Capitalism and the Public Realm, site specific LED text based installation, curated by Michel Dewilde, Dr Manfred Sellnik, Till Holger Borchert and Lies Coppens. BMCC Shirley Flterman Art Center, New York, USA. Material Way, curated by Kathleen Kucka,. Gallery Nine5, New York – Graphic, Sept 20 – Oct 30. Moving Image, Gaîté lyrique, Paris, France. Screening of The Locker Plant Projections. No Longer Empty, NY, USA. Tears on a Coffin, Site specific performative installation, curated by Sarah Crown. Light of Convergence, Aurora, Dallas, TX, USA. Colour Synesthesia IV – projection installation at The Cathedral Shrine of the Virgin of Guadeloupe. Salon Bruit, Verwektung, Stattbad Wedding, Berlin, Germany. Gallery Nine5, New York, USA. Gallery Artists.